Other than those with rare knee diseases, why do people buy Segways? To make sure they stay fat, sure, but why else? I think it’s a form of conspicuous consumption, a way to signalling to the world “I have too much money.” And if I’m right, why would anybody buy a Hovertrax? It’s like a Segway but more subtle. 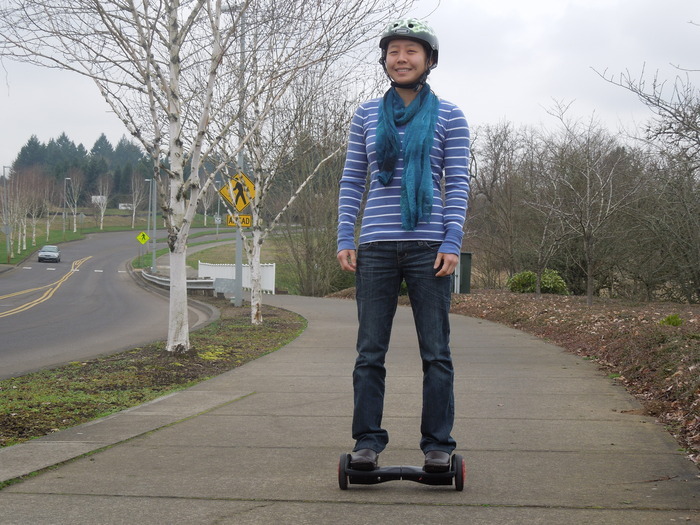 This is from the labs of Shane Chen, the same guy who produces WheeledThing “favorites”, Solowheel, Lunicycle and Orbitwheels. You can see his long-suffering model from the Orbitwheels campaign, forcing the rictus of a grin as she pretends to enjoy this thing as well. Can I go inside now? It comes out of a Kickstarter campaign and it’s sold on Skymall, so it’s practically guaranteed to be worthless. This entry was posted in Crowdsourced, Not quite a scooter and tagged Skymall on November 28, 2014 by stern.